Owl Dreaming by Trevor 'Turbo' Brown. The winner of 2012 Victorian Indigenous Art Awards. Melbourne artist Trevor 'Turbo' Brown has received the Deadly Art Award, Victoria's highest honour for an Indigenous artist, at the 2012 Victorian Indigenous Art Awards. 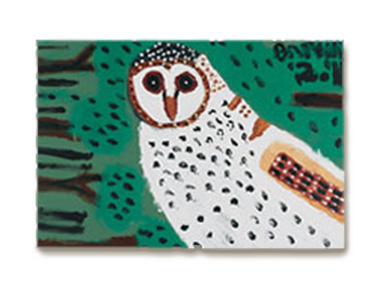 Turbo received the $25,000 award for his painting Owl Dreaming, a portrait of a 'spirit owl' he rescued while living in Mildura. Minister for Aboriginal Affairs Jeanette Powell said Owl Dreaming was a striking work that stood out among the 27 shortlisted in this year's awards program. "Turbo's winning work is a commanding piece with a great story and serves as a contemporary expression of his connection to animals from his country," Mrs Powell said. Seddon artist Brian Martin was highly commended in the Deadly Art Award category for his charcoal landscape drawing Methexical Countryscape: Wurundjeri #2. "The Victorian Indigenous Art Awards aim to showcase and promote the talent and diversity of Victoria's Indigenous arts sector," Mrs Powell said. "And this year is a shining example with stunning works that range from traditional painting and weaving to photography, drawing, sculpture, video and street art." Over $50,000 in prizes were awarded on the night. California Gully artist Simon Penrose, a first time entrant, received the $5,000 CAL Victorian Indigenous Art Award for Works on Paper. Northcote artist Glenda Nicholls received two awards, the $5,000 CAL Victorian Indigenous Art Award for Three Dimensional Works and the $5,000 Koorie Heritage Trust Acquisition Award for her intricately woven Ochre Net. The winners were selected by an expert judging panel comprising Jason Smith, Director of Heide Museum of Art and artists Dr Treahna Hamm and Clinton Nain. Mrs Powell congratulated all the winners and invited the public to cast their vote for the $2,500 Arts Victoria People's Choice Award. "The experts have made their decisions and now it is the public's turn to be the judge. I encourage everyone to take the opportunity to vote for their favourite work in the Arts Victoria People's Choice Award. It's a great way to see which works capture the public imagination," Mrs Powell said. An exhibition of all winners and shortlisted works is now open until 31 March at the Awards partner gallery, fortyfivedownstairs - 45 Flinders Lane, Melbourne. Entry is free. To cast your vote for the Arts Victoria People's Choice Award, visit: arts.vic.gov.au/peopleschoice - voting closes Tuesday 20 March 2012. The Victorian Indigenous Arts Awards are a Victorian Government initiative through Arts Victoria. The 2012 awards program and exhibition have been delivered in partnership with fortyfivedownstairs. Full details of the award winners and highly commended artists are below.